How do I manage the transition from ICT to Computing? How do you develop a vision for your school? Can you provide examples of milestones that you would expect to go through to implement your mission statement? How can we engage learners and parents with Computing? Do academies and free schools have to follow the National Curriculum? Do special schools or PRUs have to follow the National Curriculum? How much time do I need to allocate to Computing lessons? How much time should I allocate to each of the different strands (CS, IT and DL) of the Computing curriculum? How can we develop our extracurricular opportunities for learners? Do you have any guidance on preparing for an Ofsted inspection? How do I perform a work scrutiny in Computing? What should I be looking for during a lesson observation? Has your school a functioning website? What technology do I need to teach the Computing curriculum? How should I choose a programming language? 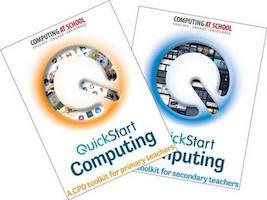 Primary or Secondary Teacher alike can get started with 'Managing the Transition from ICT to Computing' by working through Section 3 (pages 19 - 27) of the CAS Secondary QuickStart document. This document can support the development of a vision for Computing for your school that will meet your learners’ needs, be engaging, and meet the requirements of the new curriculum. Use the FAQs from Innovate My Curriculum on getting started with planning your curriculums to begin the process of implementing this vision. As outlined in CAS QuickStart Secondary Computing, begin by working with colleagues in your school to define what you mean or understand by the word 'curriculum'. Then, think about the word 'creativity' and what this means. This can be tricky, but it is well worth it (starting point: "Creativity is something that is both original, and valued"). Finally, do it once more for the word 'Computing', while considering your learners' future educational or employment needs. Work with these same colleagues to combine these definitions into a single understanding of what is a creative Computing curriculum, and how is it going to support your learners’ needs. This vision will form the basis for your mission statement. This mission statement can then be broken down into a series of milestones and activities for implementing that curriculum over the next few years. To start your transition with purpose, begin by writing a mission statement for your school, emphasising creativity and Computing. This statement can also be used in your school’s Computing policy. "The curriculum will be broad and balanced, with the breadth and depth interpreted at the level which supports the learners in whichever pathway they choose at Key Stage 4 and beyond, whether that be a Computer Science, an Information Technology or a Digital Media examination". "Focus will be on the pedagogy of teaching the broader Computing concepts and principles in the National Curriculum through, wherever possible, teaching Computing without computers, and where the foundations of computer science provide for a better application of Information Technology and consideration for the implications of technology in school, at home and, broader, in society. It should engender a feeling that Computing, and in particular programming, isn't hard if you understand how to solve problems. Use Computational Thinking to develop confidence in being creative, and to build resilience in learners to solve scalable problems." "To engage all learners, and avoid positive discrimination, schemes of work must always have relevant links to ‘real life’ and other subjects. Using programming tools to bridge the gap between models (good Computational Thinking) and computers, and selecting the appropriate language to meet the challenge and enable you to teach the concepts (e.g. repetition and selection) rather than just teaching a range of languages for the sake of it!" "Learners will not be taught discrete lessons in the foundations of (Computer Science), applications of (Information Technology), or implications of (Digital Literacy), but instead will receive an integrated Computing curriculum where learners cannot distinguish between the Computer Science, the Information Technology and the Digital Literacy elements of the lesson or scheme of work - instead the focus being on 'Why'!" Aspects of this vision will be more suitable to either the primary or secondary education phase. However, it should provide a good starting point to develop your own. It is important to consider if your school is 'introducing Computing' or 'embedding Computing'. To answer this question, begin by evaluating the existing school curriculums, staffing needs, and choice of qualifications, etc. It is important to evaluate the school curriculums against the learners' future educational and work needs, the SSAT document 'Why change is needed' within the Redesigning Schooling series asks some really important questions about what learners needs could be in the future workplace, but, at a more practical level, it can be evaluated against something like the Computing Progression Pathways. Continue this process by developing a 12 month plan, as well as a rough outline for a 24 and 36 month plan. When putting this plan into action, success will depend on managing change carefully, and doing it gradually. Too much change will be difficult both for colleagues and for learners. Have a plan and continually review that plan as it is implemented. Do not be afraid to make changes along the way if circumstances alter, the vision develops, or if problems are identified. An audit of your school’s existing curriculum against the National Curriculum Programmes of Study and Computing Progression Pathways documents. Staff training (CPD) being made part of school, subject, and personal development plans (performance management) and gradually implement the up skilling of colleagues over a period in line with developing your school’s curriculum e.g. 2 to 3 years. Develop an understanding of what assessment data is needed, and how and when formative and summative assessment will be recorded. A Skills Audit of colleagues to identify their areas for development - where are they going to go for up-skilling? There are a number of initiatives coordinated by, many commercial and non-commercial organisations. An evaluation of qualifications taken at your institution and whether they meet the learners’ future educational and work based needs. "In judging the effectiveness of leadership and management, inspectors must also judge whether the school’s arrangements for safeguarding pupils are effective, and whether the governing body ensures that these arrangements are effective. There is detailed guidance on evaluating safeguarding arrangements in ‘Inspecting safeguarding in early years, education, skills settings’." Remember that the Digital Literacy coordinator need not necessarily be a member of the Computing team. As well as keeping your learners safe and complying fully with excellence in online safety practice, the school could free up their Computing leads to focus on Technology Enhanced Learning, which could have benefits across the curriculum. Audit or survey the school’s other subject needs for Technology Enhanced Learning to help identify the skills needed at different points during the school year, and in which year groups. We recommend doing this during the summer term to give colleagues time to inform planning and provision for the next academic year. This ensures that assets, etc. are planned for the year and will help to prevent last minute requests. The Computing curriculum is academically rigorous, and needs sufficient curriculum time to cover it in appropriate breadth and depth. Consider whether additional (and sufficient) curriculum time needs to be made available for the teaching of Digital Literacy to support the development of Technology Enhanced Learning in the school. The focus of learning in the other subjects is not on the technology but on the use of technology to enhance learning, attainment and, most importantly, to evidence the learning. This might involve scheduling Computing lessons in non-IT rooms to make the computer suites available for other subjects to access. The use of extra curriculum clubs to trial schemes of work to be launched the following year. This can also be an opportunity for training staff! The list above is not exhaustive, but it should provide a good starting point to develop a plan for effectively implementing change throughout the academic year. It is important to engage colleagues, and create a sense of ownership when making the transition from ICT to Computing. One approach is to develop a presentation including timeframe and a plan for effectively implementing these changes to school governors, colleagues, and parents. Helping learners, parents and other stake holders to understand the extent of the changes to the Computing curriculum can be tricky, especially in Secondary education when trying to ensure uptake of the different Key Stage 4 Computing qualifications that may be on offer. Schools are experimenting with many different approaches, depending upon the relationships they have with the different stakeholders mentioned. It appears that the anecdotal success of these approaches has varied depending upon knowing how best to communicate with these stakeholders, combined with the age-range of the learners involved. These approaches include "show and tell" assemblies, parent helpers, school trips, school open evenings, and extra-curricular clubs and competitions, wall displays, parent and learner classes, and external speakers. We are sure there are also many more tried by schools. Using whole school agendas is a useful mechanism for driving change. One approach might be to use the school rewards and recognition policies. This can prove successful with learners in upper Key Stage 2 and Key Stage 3. One example of this being applied successfully was in relation to a school literacy focus. 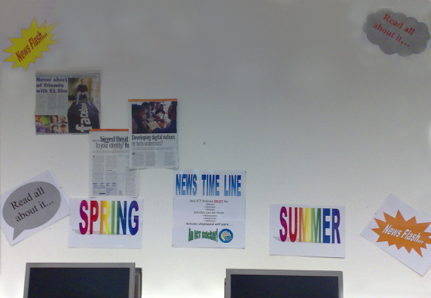 The Computing coordinator combined this with another whole school focus to have more wall displays that were interactive, and that evolved over an appropriate time period i.e. a term or school year. So, the Computing coordinator set the learners a challenge to find news articles that mentioned how the subject of Computing was being used in other fields in order to benefit society, for example in medicine or sport etc. The learners (often their parents and the wider family) would read the newspapers and online news looking for relevant articles. 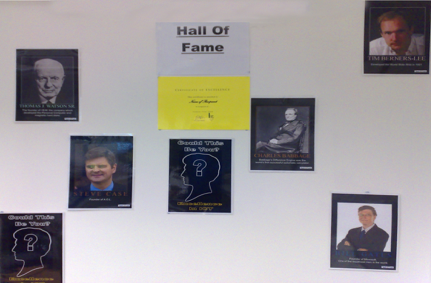 When the learners took their articles into school and gave them to a member of staff, the teacher placed their articles on to a wall display, and gave the learner a "merit" toward the whole school rewards system i.e. recognition certificates. After a couple of weeks of running this initiative, and once it was well-established, in an effort to stem the number of merits the Computing coordinator was issuing, they decided only to issue merits to the first boy and first girl who brought them a given news article. Focusing the school curriculum onto ‘why’, with exciting project-based ‘hooks’ that link to other subjects and real life can also help to engage parents who are interested in what their children are learning, and thus they might become interested in understanding for themselves e.g. how to solve the Hampton Court maze using the right-hand maze-follower algorithm. This is often brought to teachers’ attention at school events such as parent evenings, school concerts etc. and it is important to capture that interest by encouraging the parents to come into school to be a parent helper, give a talk about their work, run a Code Club, take their child to a Coder Dojo at the weekend or encourage them and their child to see how the subject of Computing supports careers in a range of fields beyond IT. Feedback from the Computing educational community suggests that none of these approaches listed (and described) above will work simply in isolation, nor as one-off initiatives. They take time to establish in the school, and should be applied in combination. It is also important to consider the order of, and combination in which, these approaches are tried, so as to ensure that they build on a solid foundation. A good starting point is with the learners, and running extra-curricular clubs as well as evaluating and redeveloping your school curriculum. There is more information in 'Planning for Keys Stages 1 – 3' on creating an engaging and inspirational Computing curriculum for your learners. Academies and Free Schools are not required to follow the National Curriculum, but should be teaching Computing in order to offer a "broad and balanced" curriculum. Non-maintained special schools are required to follow the National Curriculum. However, both Independent schools catering for learners with special educational needs and Pupil Referral Units (PRUs) are not required to follow the National Curriculum. They must offer Computing to ensure that they are providing a "broad and balanced" curriculum for their learners. "Schools are free to decide how much teaching time should be allocated to each subject. They should allocate enough time to ensure they cover the Programmes of Study in their entirety and to meet the needs of their pupils." In practice, Computing is an academically rigorous subject which requires sufficient timetabling to deliver a curriculum with an appropriate breadth and depth. The development of competences (knowledge and Computational Thinking skills) requires repeated and continuous reinforcement throughout the academic year. From listening to the Computing education community, a minimum of one hour per week for studying the subject (which does not have to be in IT suites) is recommended. In primary schools, one approach might be to maximize the cross-curricular opportunities by using resources from organisations such as CAS Barefoot Computing and Digital Schoolhouse projects. The statutory requirements laid out in the Programmes of Study are not labelled under these three strands (Computer Science, Information Technology and Digital Literacy), although definitions for these strands are outlined. The definition of Digital Literacy is still open to some interpretation. Teaching time should not be weighted by the number of bullet points in the Programmes of Study. Nor should the same approach be applied to the learning statements in the Computing Progression Pathways. The curriculum content balance and time allocated to the subject of Computing should reflect the learner’s future educational (possibly examinations) and work based needs. Cover the content in a broad and balanced way, that is integrated, stimulating and creative! "how well the school supports the formal curriculum with extra-curricular opportunities for pupils to extend their knowledge and understanding and to improve their skills in a range of artistic, creative and sporting activities"
Developing your school’s provision of extra curricular clubs can be an essential tool in developing the school’s Computing provision. It can also helps fulfil the school’s requirement to provide extra curricular opportunities. It can also be a great opportunity to build the confidence of colleagues by team teaching with them or utilising support from University Student Ambassadors and Industry volunteers whilst testing out new learning journeys (schemes of work). There are many commercial and non-commercial providers offering materials for extra-curricular activities, but an excellent starting place would be either Code Club or the Digital Schoolhouse projects. Begin by watching the video of David Brown, Ofsted's National Lead for Computing, addressing some common questions. Ofsted acknowledges that schools are presently in a transition period. Do you have the following documents as evidence of your transition? A vision for the subject of Computing that meets your learners’ future educational and work based needs. An action plan for implementing your vision for Computing in your school with a series of milestones with assigned owners. A plan for embedding Technology Enhanced Learning in other subjects, based on an awareness of the needs of all subjects including Computing. An audit/plan to ensure that all Computing equipment used by teachers and learners is relevant and fit for purpose. Both excellent subject content knowledge and subject pedagogical knowledge to create new (and adapt existing) curricular? Have you and your colleagues done a skills audit and developed personalised plans for continued professional development? High expectations of learners’ potential in Computing? Opportunities to access professional development in Computing? Their professional development needs recorded as part of their performance management cycle? Is broad and balanced and with an appropriate breadth and depth that meets your learners needs future educational and work based needs? Represents the subject as a whole rather than as it component parts (strands) i.e. Computer Science, Information Technology and Digital Literacy? Is relevant to learners, based on real life scenarios and cross curricular opportunities? Is fully inclusive of all abilities regardless of their individual educational needs. In particular providing opportunities to extend your most able learners e.g. through open-ended tasks, etc. Encourages learners to use and apply a range of software and hardware (including internet services)? Does your school have a functioning website? Have you made your curriculum information by subject and year available on your school website for parents and carers? Has sufficient curriculum time been allocated to the subject of Computing to enable good teaching of a curriculum that meets your learners needs to take place? Has your school moved away from the previous National Curriculum levels and is now using (or at least developing) an appropriate assessment framework and approach to reporting? Is your approach to assessment in Computing consistent with your whole school approach to assessment? Does your assessment framework for Computing match your school curriculums? Do you have a strategy for making use of your previous level-based assessment data? For example, can you map the content from your previous assessment framework to your new assessment framework? Are you able to provide sustained quantitative and qualitative data, from a range of sources (e.g. learner surveys, tests, teacher assessments), both formative and summative, for all learner groups and abilities? Are you analysing assessment data to improve outcomes for these different groups of learners? e.g. Is it helping to close the gap? Are you ensuring that the assessment data is accurate through internal and external standardisation and moderation at the end of Key Stage and each year group? Are you effectively reporting learner’s attainment and progression to parents and carers? Are you using the scrutiny of learners’ work effectively to improve the quality of teaching and learning? Are you offering a range of extra curricular learning opportunities related to the subject area? For further guidance view the latest slides by David Brown, National Lead for Computing at Ofsted:. The purpose of a learner’s work scrutiny is to understand, over a period of time, how the curriculum is being implemented, the quality and consistency of teaching, and the attainment and progression of learners. It is important to set a clear focus in any work scrutiny by having a clear question of what it is you are trying to find out. The desired outcome from any work scrutiny is to identify areas of development within your school or department (e.g. gaps in the curriculum, resource needs, staff CPD, etc.). This should be fed back to colleagues and you should work with them to decide what the next steps are e.g. to provide sufficient tailored support to individuals. It is important to set a timeline for addressing any areas for development. Then measure the impact of any interventions following a work scrutiny; triangulating it with learners’ assessment data, learner feedback and survey data. how well teachers’ feedback, written and oral, is used by pupils to improve their knowledge, understanding and skills. Inspectors should note the clarification points set out in Part 1 about pupils’ work and marking." At the heart of the National Curriculum for Computing is Computational Thinking. All individuals who are part of the professional development process should be looking to evaluate the learners’ development of both Computational Thinking and subject content knowledge. The Ofsted Inspection handbook on page 60 (paragraph 191) outlines that "children’s enjoyment of learning, including their participation and willingness to make choices and decisions, and the extent to which children are active and inquisitive learners who are creative and think critically" will part of any judgement. This can be evidenced during lessons where Computational Thinking is made explicit. To achieve this, begin by ensuring that all individuals have a consistent understanding of what Computational Thinking is, and how to identify it in learners’ activities. Begin by reading the CAS Computational Thinking Guidance for Teachers and then view the CAS Secondary QuickStart Guide which has an updated version of the Ofsted Evidence S5 Observation Form with prompts for users to focus on the Computational Thinking during the feedback process. For further guidance on what a Computational Thinking classroom looks like, read the free guide by Innovate My Curriculum 'Getting started with Computational Thinking'. Ofsted has stopped individual lesson grades during an inspection. Instead, a judgement about teaching and learning will be made over a period a time. A discussion should take place between the Ofsted Inspector and the teacher to explore how the lesson fits into the wider Computing Curriculum. Inspectors will look at further evidence to support this judgement e.g. assessment evidence. "information on the school’s website, including its statement on the use of the pupil premium, in primary schools the PE and sport premium, the statutory sharing with parents of curriculum information (so the lead inspector can start to assess the breadth and balance of the school’s curriculum and whether it is likely to promote preparation for and an appreciation of life in modern Britain), the special educational needs (SEN) information report, the presence and suitability of the safeguarding guidance, taking into account current government requirements, information about the promotion of equality of opportunity and other information for parents"
To prepare the school network to enable the effective teaching of Computing, we would recommend that school network managers and technicians read the CAS guidance publication called School ICT Infrastructure requirements for teaching Computing to understand the infrastructure needs of staff teaching the Computer Science strand of the Computing curriculum as well as navigating the infrastructure decisions to ensure that usability for staff and learners is appropriately balanced against security. Both Primary and Secondary schools read the Innovate My Curriculum Digital Literacy and Technology Enhanced Learning guidance on implementing Bring Your Own Device (BYOB). A good starting place for answering your curriculum related questions is Hodder Education’s series of practical video guidance. One of these short guidance videos is focused on the considerations for choosing an appropriate programming language.